How many times have you seen an advertised coupon for something you don’t need? You decide the service you need and we’ll give you the discount up to $25. 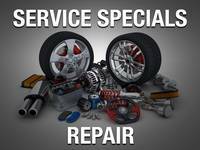 *OTHER RESTRICTION MAY APPLY—SEE SERVICE ADVISOR FOR DETAILS.